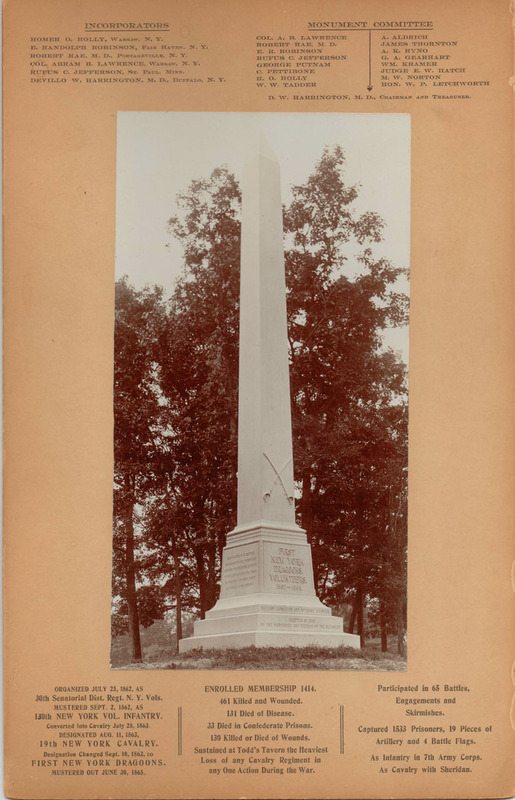 "Photo Souvenir of the Dragoon Monument"
Around the time of the dedication of the Monument to the 1st NY Dragoons, a photograph of the new monument was published along with a list of the monument committee and a brief history of the Civil War unit. It is likely that this mounted photograph served as a souvenir for the reunions that were held nearby. The photograph, along with the original captioning, is found below. A copy of the caption follows the image. For more information see the 1st New York Dragoons and Glimpse of the Dragoon Monument ,the Story of Camp Portage and Image 191. Rufus C. Jefferson, St. Paul, Minn. Organized July 25, 1862 as 30th Senatorial Dist. Regt. N Y Vols.